Cyber security has been at the forefront of the news with major security breaches impacting some of the largest companies in the United States, including JP Morgan Chase, Staples, eBay, Home Depot and more. In addition to traditional online methods of transferring viruses and malware, hackers have now begun to use portable media, such as USB “jump drives,” as a way to infiltrate secure networks. In 2012, two U.S. power plants were infected by viruses that gained access to the highly secure networks through the use of USB sticks. As a result, it is more important than ever to not only secure the computers and devices that have constant access to a network, but also ensure that any portable media has been thoroughly screened for viruses and malware. Olea Kiosks has partnered with OPSWAT to provide a highlysecure anti-virus and anti-malware kiosk solution that will run OPSWAT’s Metascan software on portable media to prevent virus attacks that are perpetrated through portable media. The California Kiosk is the latest kiosk model launched by Olea Kiosks, an award-winning kiosk manufacturer. The California is a sleek unit with a small footprint that makes it a versatile interactive kiosk solution for any deployment. The California comes with a universal device reader on the front panel for quick and easy scanning of any portable media, such as a USB drive or a DVD. The internal components are easily accessed through the front panel, but in order to ensure that the highest security protections are maintained, the entire unit comes outfitted with highly secure locks to deter unintended access. In addition, the kiosk is fully ADA compliant, so it is a great solution for government agencies. Like Olea’s California Kiosk, OPSWAT’s Metadefender software is a cutting edge cyber security solution. Metadefender utilizes OPSWAT’s Metascan security software to detect and prevent both known and unknown security risks based on a complex set of APIs. Any possibly malicious file is flagged and quarantined to prevent any further access. Metadefender is easily configured through a web-based interface to allow for multiple security rules based on varying security privileges and access levels within an organization. The industry leading technology of the Metadefender software and the Olea California kiosk combine to provide a best-in-class cyber security anti-malware solution. 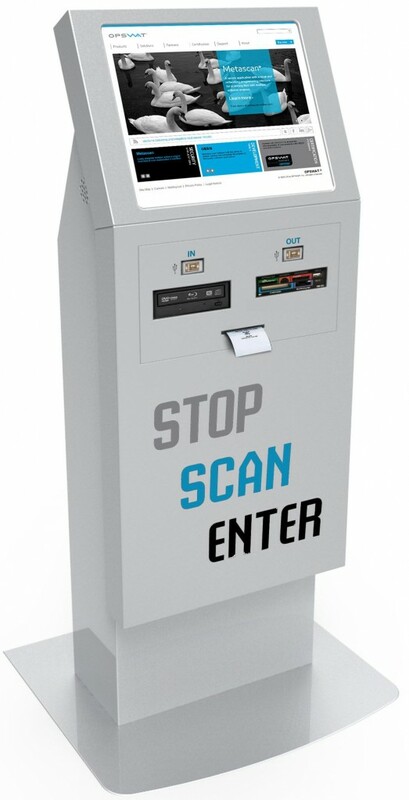 This cyber security kiosk can be deployed both connected to a network or in an offline/air-gap environment. Contact Olea Kiosks today to find out how Olea’s anti-malware security kiosks can enhance the security of your network.